Weeks of heavy fighting in Somalia took an even deadlier turn Thursday when a suicide bomber drove a car full of explosives into the front of a hotel in the west of the country, killing Somalia’s national security minister, a former ambassador and at least 20 others. 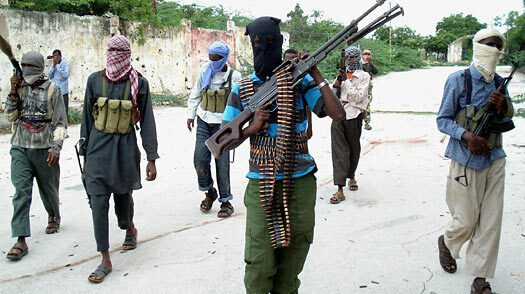 Somalia’s extremist Islamist militia, al Shabaab, said it carried out the attack. In the capital of neighboring Kenya, Somali Prime Minister Omar Abdirashid Ali Sharmarke said he had information that more than 100 people were killed. The attack underlined fears that Somalia is developing into a third front in the war against terrorism and militant Islam. It also was the bloodiest episode in two months of heavy fighting in which Sharif’s beleaguered government has consistently ceded ground and lives to Sharif’s former allies in Somalia’s hardline Islamist movement. The fighting, often in and around residential areas in Mogadishu, has killed hundreds and displaced more than 100,000. Hours before Thursday’s attack, 17 people died in fighting in Mogadishu. Those deaths came just hours after Mogadishu police chief, Ali Said Hassan, was killed. The ferocity of the fighting and its high-profile victims raises the chances of Sharif’s government falling to the Islamists. Nairobi-based Somali analyst Abshir Hassan said of Thursday’s attack: “It will change a lot on the ground, and it is a major set back to the government to lose this competent minister.” The fall of Sharif’s government, would represent a double blow, both to prospects for peace in Somalia and to forging a bridge between the Islamic and Western worlds. Sharif was a founder of the Islamic Courts Union , a hardline Islamic law-and-order collective that briefly ruled Mogadishu for six months in 2006. The ICU succeeded in ejecting the country’s warlords from the capital and imposed a modicum of rough justice. But after another ICU leader, Sheikh Hassan Dahir Aweys, declared a jihad on neighboring Ethiopia, Ethiopia invaded and toppled the ICU. Sharif and Aweys agreed that all foreign troops must leave Somalia and supported a national resistance against them. But after Ethiopian troops pulled out in 2008, the two split. In January, Sharif formed a government that espouses Shari’a law but also seeks dialogue with the West. Aweys formed the more militant Hizbul Islam, which is seemingly opposed to any contact with the West. He also allies himself with al Shabaab, originally the ICU’s militia which today, while publicly denying links to al-Qaeda, has managed to attract hundreds of foreign jihadis into its ranks. If that collision of big guns and bad ideas weren’t enough, lawlessness on land has spurred more of it at sea, making Somalia not only the world’s most failed state and the home of its worst humanitarian crisis but also a center of piracy. The geo-strategic elements of this enduring catastrophe explain why it is watched blow by blow by both the U.S. and al-Qaeda. See pictures of Somalia’s pirates.